Since 2007, 'Altered Reality Entertainment' have proven themselves to be a first class firm who can produce a plethora of first class events'. Not only have they firmly established such multi-genre fan-favorite conventions like the ever popular Rhode Island Comic Con, the always glamorous Colorado Springs Comic Con, and the totally breathtaking Terror Con, but in addition to this, they have recently announced a new event for their 2018 calendar, that being the Empire State Comic Con. Scheduled to take place between the 6th and the 8th of April, 2018, this brand new event is planned to be held at the Albany Capital Center, situated in Albany, New York. Fans can expect to meet current and legendary actors from both the large and small screens, including other icons of pop culture, such as talented comic book artists, writers, performers, and cosplayers. Plus on top of that, this three-day event will also showcase vendors of collectibles and toys, and feature a cosplay competition. So far some of the special guests who've confirmed their attendance include Steve Cardenas (The martial-artist best known for playing the Red Power Ranger); Ian Chase Nichols (The artist on the Teenage Mutant Ninja Turtles title); Sean Gordon Murphy (Another comic book artist, but he's worked on such books as Batman / Scarecrow, Teen Titans, and Hellblazer, among others), and of course, more notable names will be announced shortly. Everyone who attends the Empire State Comic Con will be able to check out many of the other tropes Altered Reality normally have up their convention shaped sleeve: Such as Kids Con (Hosted by the adorable Verónica); a number of gaming events (Or should that be 'competitive tournaments'? ); Ink-Fusion (Where the worlds of tattooing and pop culture collide); Talent Search and Portfolio Reviews (Wow! Do we need to say more? ); and now, for the first time ever, they also have, Sci-Fi Speed Dating (Are you single and tired of looking for love in Alderaan places? Then what are you waiting for? Get ready to Terminate your single life for that someone special, and I don't mean your favorite action figure). 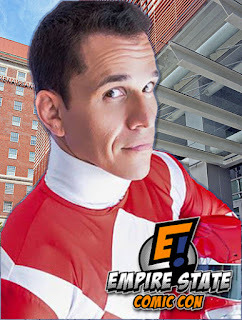 What: Empire State Comic Con, 2018. Where: The Albany Capital Center, 55 Eagle Street Albany, New York, 12207. When: From the 6th to the 8th of April, 2018. How much: Tickets are currently on sale through the event's website, and prices start at $25 for adults and $10 for kids between the ages of six and twelve. VIP passes are also available. Now for any more information please feel free to check out their official website, facebook, and twitter pages.